Earn up to 736 reward points. Get huge tone from a board-friendly preamp. Mooer micro preamps are sonically accurate digital recreations of the preamp sections of popular tube amplifiers. They were developed by directly analyzing real tube amplifiers using a technology to capture their sound, dynamics and response. Each Micro Preamp comes complete with dual channels, integrated speaker cabinet simulation and dual operating modes to suit the needs of all users. Initially Mooer is releasing a set of 10 models, each based on a different popular tube amplifier from a range of manufacturers. These have been designed to be used with the upcoming Mooer power amp or in the effects return of any standard guitar amplifier. The speaker cab simulation allows the user to connect direct to a soundcard, powered monitor or P.A. without the need for a guitar amp or speaker cab at all. INPUT: Connect your instrument directly or the output of your pre, pre-amp effects like Overdrive, distortion, etc. Different power amplifiers will affect the outcome of the final tone.You can also connect directly to a sound card and activate the speaker cab simulation for recording purposes. 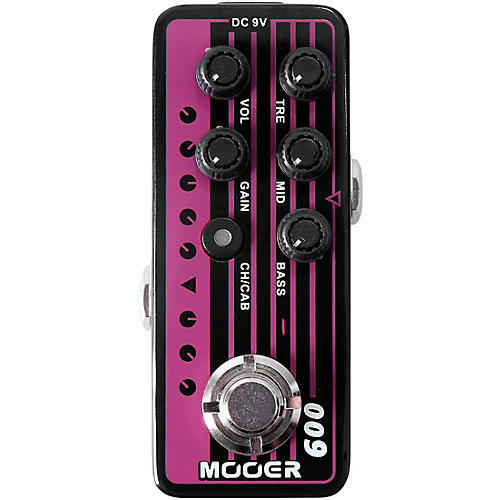 Note: You can connect your effects loop effects, like modulation and time based effects, in between the Mooer preamps output and the input of the power amp (fx return). Modes: Delay and reverb effects with tap tempo functionality.